Last night after dinner I was craving something sweet, but was in one of those moods where spending a lot of time making dessert happen was not at all on the cards. My solution? 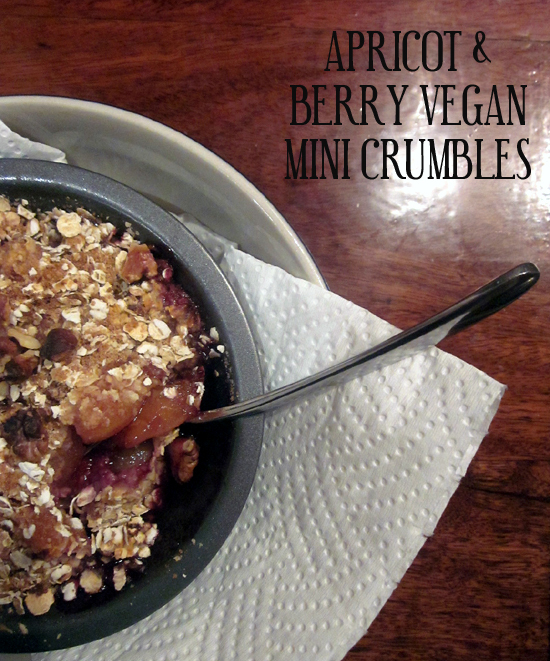 An easy, old school fruit crumble. The only hard part about this whole gig, is leaving the cooked crumble to sit for long enough that you don’t burn your mouth, trying to dig into piping hot pieces of fruit! The crumble comes together in an instant, with no chopping or fussing involved. You just throw the fruity stuff in one bowl, the topping bits and pieces in another and then divide half of each between a couple of small pie dishes. This recipe makes two mini crumbles, enough for you and one lucky other; if you are cooking for a handful of people, triple the recipe and bake it up in a 9″ pie dish. To change things up a little, try using peaches instead of apricots. Strawberries and boysenberries would be a great substitute for raspberries and blueberries. If you don’t have any berries to hand, throw some very thinly sliced apple into the mix. The next time your brain gives you a Lazy Dessert alert, you have got to give this a try. It is so tasty, almost effortless, and the perfect thing to accompany the sheets of rain that have been swirling and snapping outside lately! Lightly grease two small pie dishes or ramekins (approx 4″ across) and set aside. In a small bowl, combine the apricots, raspberries, blueberries and vanilla extract. In a seperate small bowl, add all topping ingredients except walnuts and mix well. Spoon fruit mixture evenly into the prepared pie dishes/ramekins, followed by the topping. Sprinkle walnut pieces over each crumble, then drizzle a couple of tablespoons of the reserved apricot juice over top. Bake for 15 – 20 minutes until top is golden brown and fruit is piping hot. Sit 5 minutes before serving.